Letter-writing is turning into a lost art. Think about the last time you wrote to someone. My son learned to write a friendly letter this year and has yet to use it. I asked him to write to his cousin at camp and he keeps asking me why we can’t just text him or use FaceTime? Don’t get me started on cursive: most children can’t even read cursive anymore. Further, when was the last time you wrote a business letter rather than an email? If you really want to get a company’s attention these days, you skip all those steps and just tweet about it. I read all my books on a Kindle (if you’ve read my earlier posts, this should come as no surprise). Friends of mine say they like the feel of a book in their hands. I disagree. For me, it’s all about convenience. Yet, with a letter, I completely get it. I want to hold a letter in my hand, to see the penmanship, feel where their pen etched the paper. It took me only a few minutes to write the letters tonight. In the first line to my son, I tell him that this is my first letter to him, but hopefully not the last. What will I do with these letters? I thought about hiding them in the time capsule, however, my son wants to wait until the age of thirty to open it, which I feel is too long. Perhaps on the day of their high school graduations, I’ll say, “Oh, one more thing. I wrote you a letter when you were 7.” Or, maybe on a random day, years before I’ve planned it, on a day that they’re feeling particularly blue, I’ll present the letters and we’ll sit together as they read. (And of course, as a mother who worries, the thought of me not being around when they find the letters crosses my mind too, but to me, that’s all the more reason to do this now). This all brings me smoothly into tomorrow’s challenge . . . I heard about setting up an email account for your child years ago and regret that I didn’t do it earlier. Do you know all those things your kids do that you think you’ll remember forever but you’ve already forgotten? 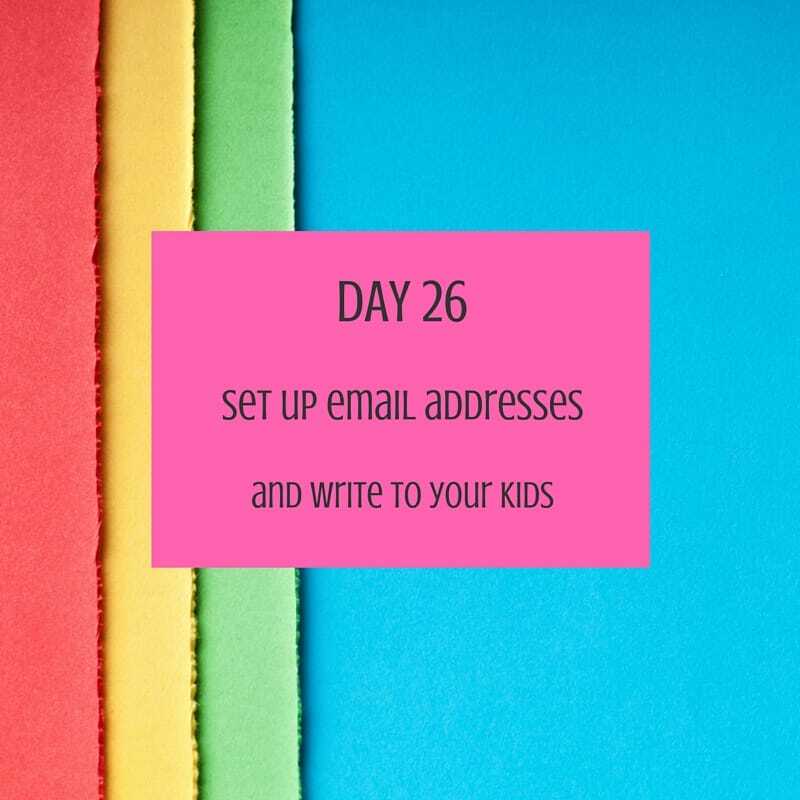 What if you could quickly send off an email to your kids and tell them? What if you could include photos and videos too? How amazing to have all these moments in one place. I’m planning on using Gmail (note: you may need to provide a different birthday since your child is a minor). What are the chances that their names are still available? Good luck on that one.